Yamuna Body Rolling works the way a hands-on practitioner works -only using a body ball. Imagine your body sinking into the ball, lying over it, as you move muscles stretch, tension releases, blood flow increases, and self-healing begins.YBR gives you the ability to work on yourself, anytime, anywhere. I WILL BE AVAILABLE FOR TAROT READINGS. PLEASE EMAIL OR CALL ME AS I WILL BE TRAVELING AND WILL HAVE LIMITED INTERNET- THANK YOU! Email Vicki if you'd like a private or semi-private class. Look years younger in less than 10 minutes with this incredible technique. Smooth wrinkles, release tension, and increase circulation. The face is subject to tremendous repetitive stress from very early on. We begin to frown, squint our eyes, clench our jaws, grind our teeth, tighten our lips and more. The Yamuna Face Saver technique releases the tension that has built up over time and reverses the effects of the tightness which causes wrinkling. ​​Ease TMJ discomfort. 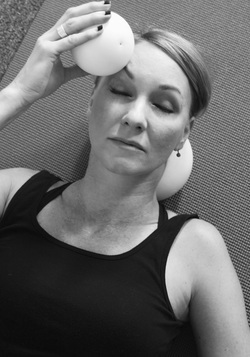 headaches and sinus trouble by using a special ball designed for the face. ​PS This is not just for women, men can look beautiful too! Your feet are the foundation of your body’s architecture. The way you stand and the way you walk transfers into your posture and over time affects how stable and flexible your body becomes. Taking care of your feet is the ultimate in self care. Restore flexibility and stability. Tone your legs by using your feet. Foot Wakers increase range of motion and foot savers strengthen as well as align. It can also reduce painful foot conditions such as hammer toes, bunions, neuromas, and plantar fascitis with powerful and energizing routines. The ancient tradition of Yoga offers physical benefits such as improved cardiovascular functioning, stronger muscles and bones and increased flexibility. This process is aided by the Yamuna body balls, allowing you to go deeper, hold poses longer, remove obstacles and restrictions while radiating power and grace. The experience of quieting your mind and connecting with your breath leads to a deeper sense of well-being and balance.